Thank you for sharing this story; it was a very interesting read. So many thoughts come to mind, and as you know, so many questions. I believe you will begin receiving some of those long sought after answers. Congrats!!!!!! Now I wlll have to look over notes on my Caddo LA folks. I know a Few, I bet you guys have a big FB group. Look foward to more. Here’s hoping more family finds you. Thank you True! This is one side of the family with lost connections, I know tons of my Tyson side but this side has been hard to connect all the dots. I’ve spoke with other people from the White & Hill family and none can make the connections. Leave no stone unturned…. Mark, welcome to the world genealogy blogging! Your blog is excellent and I can tell you now I’ll be stopping by to learn more about your White ancestors because my maternal great-grandfather, Jack White, born Andrew Jackson White, is a mystery ancestor for me at the moment. Though he lived and died in the Houston, TX area, family believes he came from Louisiana. It would be cool if we turn out to be cousins huh? Okay I’m claiming you as kin already– LOL!! I will let you know what I find out! Thanks Marlive, this is a new journey with blogging. The White & Hill name is so common that it’s hard to connect them all. One thing is that they all seemed to live in the same area so I just research every White & Hill family in Caddo & Bossier. Much blessings…. You have a lot of interesting research here. I like the way you told where you got each piece of information. Good luck with putting the missing pieces together! Yes indeed great job Mark! Welcome to blogging, may you find many new cousins to help research Mister John. Were you able to find out if John White had any siblings or other relatives name Charles White born in or around 1824 in Tennessee? My research shows that he married a young lady named Louisiana. She was born in 1819 in Alabama. Tyson, this may be far fetched but I too come from an ancestor with the last name Dunn from north Carolina. My third great grandmother name is Mellie Dunn. She was born in 1838. I am trying to do more family research and maybe we can put some clues together and possibly figure out if there is a match. Perhaps you can email me when you can. Hi Edrick, is your Dunn family from North Carolina or Alabama? Wow! I am the 4th great grandson of Reuben White. Peter White was his “son” . born in 1832 in LA. 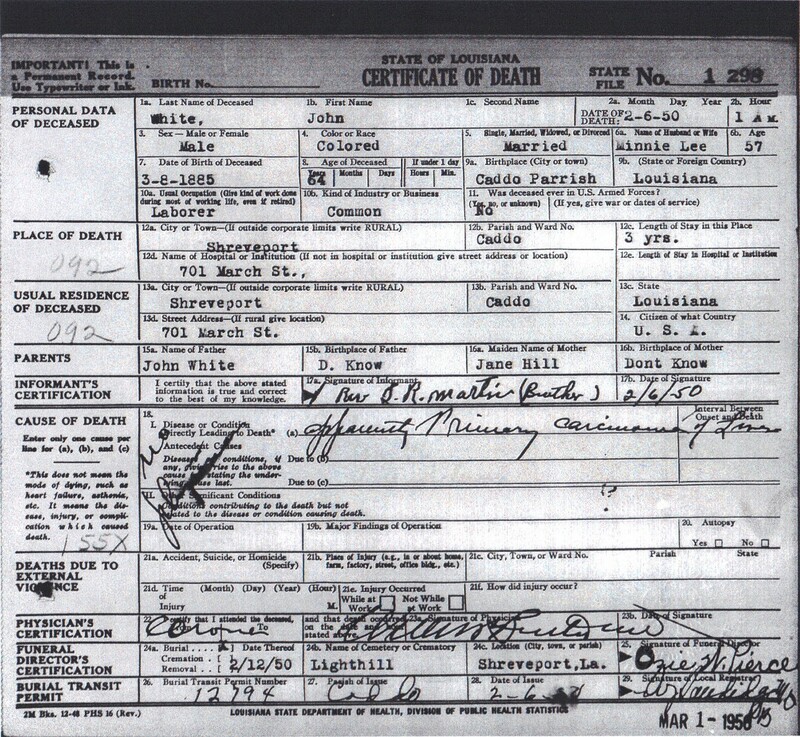 Peters death certificate says that Reuben was his father and his mother was an unknown slave. I’m assuming a slave of Reuben white. I wish I could find out more about Peter White’s mother but being a slave no real records of her are available. Thank you for putting this info on line. If I can help make any connections please let me know. Wow is right! 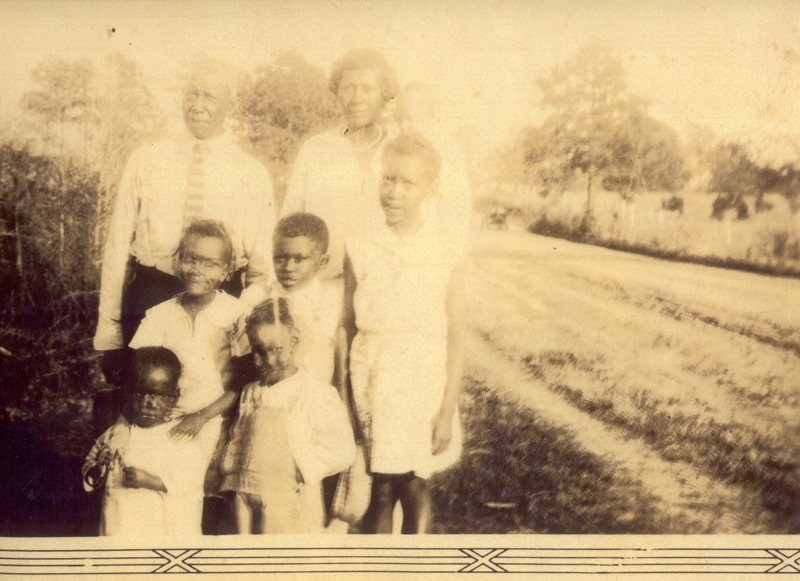 I’m still trying to figure this part of the family out so my hunch remains that Reuben White could have owned my 2g grandfather John White. Have you done any DNA testing? This might be one way to see if we both descend from Reuben OR another unknown White. Where was Peter born & raised? I have not had DNA testing. But I am going to do that. I have a copy of Peter wait death certificate. I believe he was born in Louisiana and later moved to Texas. In 1860 he moved to Canada and worked in Yarmouth Nova Scotia . He worked in the shipyards. Later married a Blackfoot Indian from Ohio. Then they moved to Leslie Michigan and started a farm. If you send me a message it mailittodan@gmail.com I will send you a copy of the death certificate and pictures of two of them. Peter weight was born in Cato parish Louisiana.